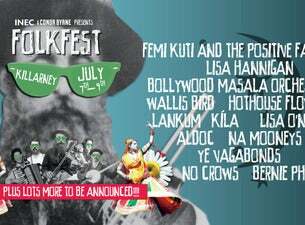 Folkfest Killarney has so much going for it. Placed right at the heart of the Kingdom at the INEC Killarney, the location provides a proper ambulant festival feel, while at the same time offering all the comforts of a hotel environment. With its on-site restaurants, bars, gym and accommodation, festival-goers can decamp for the entire weekend, all in the surrounds of the magnificent Kerry lakes and mountains. The festival’s tagline ‘From Dusk to Dawn’ sums up its timetable, with small intimate sessions in the acoustic room during the early evening, to big-band events running late into the night. Moore, The Waterboys (who are performing their only Irish gig this year), Little Green Cars, We Banjo 3, Iarla O Lionáird, Maria Doyle Kennedy, Damien Dempsey, the Mick McGoldrick Band and many more. The main headliner is Christy Moore, playing his only Irish festival date this year when he performs on Saturday July 9th at the INEC Killarney. Christy has a long association with Killarney: “I have played the INEC annually and back in the 80's and 90’s I used to play weekly in The Gleneagle and when we come to the Killarney Folk Festival we will have to be at our very best. There are lots of exciting new bands playing there, so we need to be on our toes and playing at our best. Some of those rapscallions and whippersnappers will be expecting this old boy to be past it but I’m gonna go for it. I’m not ready to lie down yet! There will be new songs and old songs and songs that ain’t even written yet”. Christy’s gig will showcase material from his newly-released album ‘Lily’, which was recently launched on the Late Late Show on RTE television. Festival programmer Conor Byrne said this week: “We are getting very excited as the festival draws nearer and are thrilled with this year’s lineup – the most high-profile so far in the festival’s two-year history. The programming also has very broad appeal, so we’re encouraging more families to come along this year – the music is friendly for all ages, kids love music and love gigs so it would be the perfect family weekend, with the great facilities on offer from the INEC and the Gleneagle Hotel”. RTE Radio One is official media partner to The Folkfest Killarney and this week, Philip King, presenter of the South Wind Blows programme on Radio and member of iconic band Scullion who perform at the festival on Sunday July 10th said: “Heading back to Killarney is like going home for Scullion and joining this beautifully curated and diverse gathering of musical friends will be a real delight. The South Wind Blows will move East from Dingle to Killarney and broadcast music song and banter from the festival on Saturday night on RTE Radio 1 at 10 pm. "